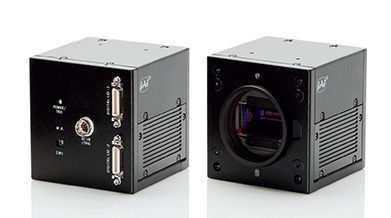 The WAVE WA-1000D-CL is a dual-sensor, multi-imager industrial camera that is capable of sensing short wave infrared light and is based on a combination of InGaAs and prism line scan technologies. The camera operation is not complicated, no cooling is necessary nor are specialised optics required, the SWIR sensors using only off-the-shelf components. Recognising that light is absorbed differently by different chemicals, deploying two sensors, each operating at a different spectrum, means these light absorption differences can be captured and double the data extracted to be used in the inspection criteria. Being perfectly aligned via JAI's prism technology, the sensors deliver dual-band imaging in the 900 – 1700 nm range, one sensor captures light between 900 and 1400 nm while the other operates in the 1400 - 1700 nm. range. The prism-based technology makes possible the precise alignment of both images in two different spectral bands even when objects are moving at high speeds.